The Dittrick Medical History Center photography collection contains a great variety of subject matter, within the scope of medical history in the Western Reserve area. These subjects include but are not limited to portraits of doctors, hospital and medical school interiors and exteriors, faculty and class photos, professional societies and their meetings, dissection, teaching materials, and depiction of diseases, including a large collection of smallpox photography. On the following pages you will find a small sampling of photos from the collections. The Lakeside Unit, comprised of Cleveland surgeons and nurses from Lakeside Hospital (now University Hospital, Case Medical Center) was directed by George W. Crile, MD, chief of surgery at Lakeside. The Unit spent three months in Paris at the American Ambulance treating French and British soldiers. This compelling story comes to life through Crile’s personal diaries and photographs taken by members of the Unit. This online exhibit features photographs from our collection of approximately three hundred dissection images. 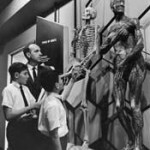 Most of these intriguing photographs feature a group of students gathered around the cadaver, either actively dissecting or just posing, often wearing their best suits. 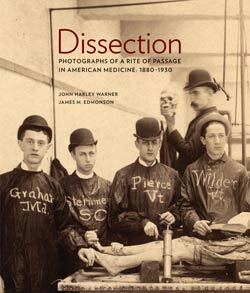 Also see the book Dissection: Photographs of a rite of passage in American medicine 1880-1930 By John Harley Warner and James Edmonson. Order form available here. The Gebhard collection consists of approximately 600 to 800 photographs, and hundreds of postcards and printed pieces on a wide variety of topics concerning health education. Many are of health museum exhibits at the Cleveland Museum and functions and activities held there.There are also photographs of German Cultural and Industrial Exhibits (1930s), the Hygiene Exposition (Paris 1924), and other exhibits and medical monuments throughout Europe and the United States. In Cleveland, the “Marion School Experiment” provided the necessary proof. 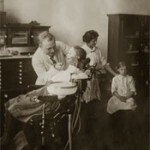 Subsequent efforts by the Mouth Hygiene Association and the Cleveland Dental Society kept preventative dentistry in the public eye, reminding people that it was preferable to the suffering the followed neglect of one’s teeth. A unique documentation of the epidemic was captured by a young physician caring for smallpox patients at the city’s “pest house.” Dr. Homer J. Hartzell headed the Cleveland infectious disease hospital during the city’s last smallpox epidemic, in 1901-1902.While he may have done so out of scientific interest, these photos speak to us across time, conveying the suffering and disfigurement brought by this terrible disease. This exhibit tells the tale of the epidemic, and shares these images publicly for the first time. Hartzell kept a personal photographic log of the epidemic, as seen in the photos presented here. Some 75 glass negatives, 40 lantern slides, and a small album came to the Dittrick in 1986, along with Hartzell’s own camera used to capture the epidemic. Dr. William T. Corlett was professor of dermatology and syphilology at Cleveland’s Western Reserve University School of Medicine. 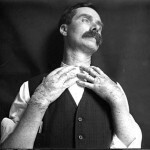 The Corlett photography collection comprises more than 500 glass negatives, depicting a wide range of dermatological diseases and conditions.